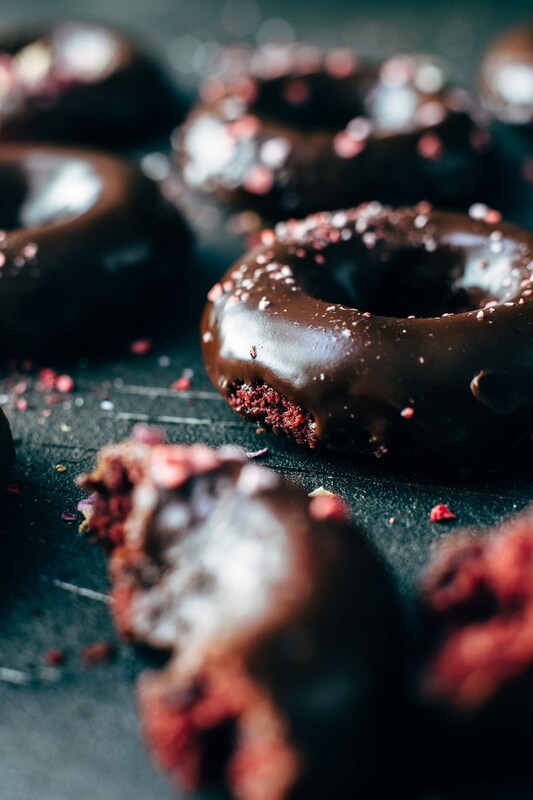 This baked Chocolate Red Velvet Donuts recipe is easy to make and perfect for Valentine’s Day. Intense chocolatey, moist, and fluffy. Step-by-step video below. Although Christmas vacation is not over yet, I’m already in the mood for Valentine’s Day baking. Crazy? Maybe. But who cares? A girl with a massive addiction to baking stuff lives literally for holiday baking. Amiright? These Chocolate Red Velvet Donuts are moist, fluffy, and have a super strong chocolate flavor thanks to adding 3 tbsp of cocoa to the batter. The cocoa makes the red color even more appealing because it turns the color into a deep red. 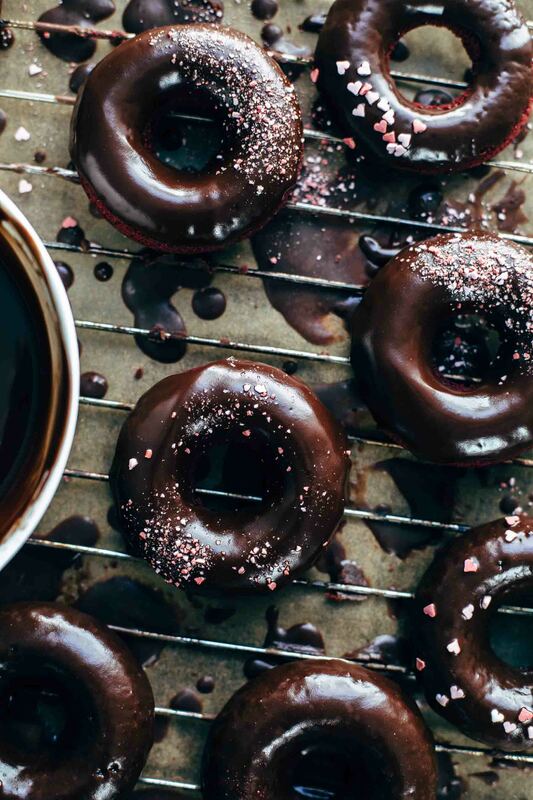 Whether you want to surprise your dear with these donuts or want to make them for your own, either way, the good news is that they are super easy to make and you don’t need a long time to make them. For the batter, you just need 2 bowls. One for the dry ingredients and one for the wet ingredients. Sift the dry ingredients in the first bowl and stir all wet ingredients together in the second bowl. Then add the dry ingredients to the wet ingredients and spoon the batter into a zip-lock bag. Pipe batter into donut pan and voilá. You are done in the first step. The chocolate glaze is in two ways amazingly amazing. First of all, you just need to place everything in a bowl and melt in the microwave. If this is not the best thing you’ve ever heard, I don’t know what it is. This means that the glaze comes together in under 2 minutes. It is a shiny chocolate glaze with a great taste and a great texture. It’s soft to bite and dry enough to touch. I mean I wouldn’t have any problems with messy, sticky, chocolate fingers after eating these donuts. But they stay clean. If you make this Chocolate Red Velvet Donut recipe, leave a comment, rate it and tag a photo #alsothecrumbsplease on Instagram! Would love to see your snap! 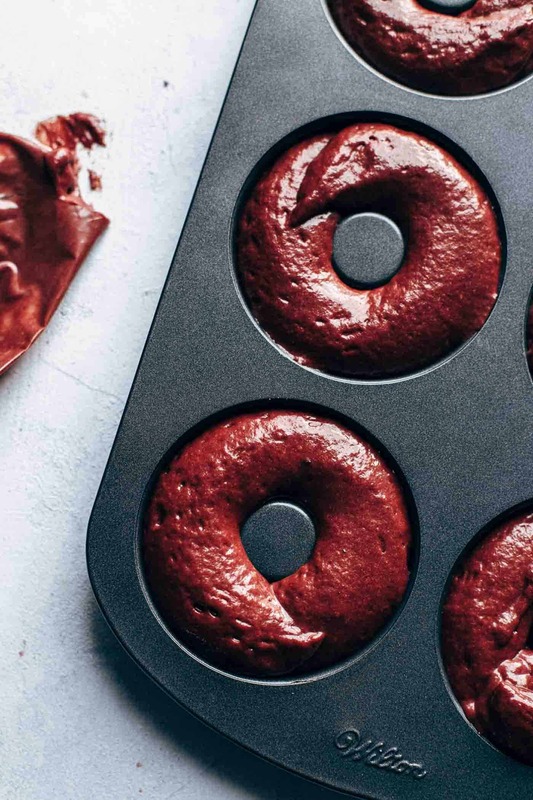 This baked Chocolate Red Velvet Donuts recipe is easy to make and perfect for Valentine's Day. Intense chocolatey, moist, and fluffy. Step-by-step video below. Preheat oven to 350°F. Lightly grease two 6-cavity donut pans. Set aside. DONUTS: In a large bowl sift together flour, sugar, baking powder, salt, and cocoa. In a separate large mixing bowl whisk together egg, buttermilk, melted butter, oil, and vanilla* just until combined. Add vinegar and red food coloring and whisk to combine. Add dry ingredients and stir just until combined. Don't overmix at any step. Spoon batter into a zip-lock bag and cut one edge off. Pipe batter into prepared donut pans until cavities are about 3/4 full (you will get about ten donuts). Bake for about 10-12 minutes until they bounce back to touch. Allow to cool in pan for about 10 minutes then transfer to a wire rack and let cool completely. GLAZE: Place chopped chocolate (I highly recommend using high-quality chocolate), butter, light corn syrup, and water in a heatproof bowl and melt in the microwave. Stir every 20 seconds to prevent seizing. Dip the tops of the cooled donuts into the glaze. Decorate as desired. Baked donuts taste best eaten the same day. Store leftovers in an airtight container at room temperature up to 2 days.